Christmas Eve I took the kidos out for a drive and went up to Kennesaw Mtn. battlefield. We had fun walking the trails and taking pictures. had on her site her very own bucket list. I thought it was neat to see what she wrote. So I thought I would write down some of my own. Although it's sad to say, but I have never been a dreamer (not good at making goals) that way. I thought of a couple and I have taken on some of my husband's wishes as well. Learn to do carpentry work. ie: build an island for my kitchen or a desk. Have family get together in one big huge cabin or condo on beach. The kids were waiting in line to see Santa! I couldn't get them to s tand still. Mason thought this snowman was soooo cool. Mason turned two Dec. 8th. If Tatum had come a few hours later they could have shared the same birthday! (sister's baby came day before) Congratulations Julie and Brent. We are thinking of you. Wish I could hold that tiny little girl of yours. Here's Mason singing Happy Birthday along with us. He was thinking hard on how to get that open. And only a week later the toy is already lost, oh well it was a loud toy and he enjoyed it while it lasted. Hopefully it'll show up again. This is the only picture I got on our trip to Tennessee. We remembered to bring the camera, but forgot to charge it. Oh well. I thought I would post our one picture so you can all see my growing belly and that darn pointy nose of mine and my sweet little boy who gets shyer by the minute. Shyer is probably not a word huh. I shouldn't post this late at night, I say stupid stuff. Macey is a funny one, that girl. With two older brothers she can be quite the tomboy and other times she's as girly as can be, but not when it comes to bows and piggytails. She can't stand them and as soon as we get home from any store or outing she rips them out, so hard in fact that she was breaking her hair off in clumps and took scissors to it one time out of frustration to get the darn thing out. Chris and I were getting tired of her hair always in her face and looking like a rats nest. I got her out of the shower the other morning and I had had enough of her whining about doing her hair. I didn't even wait to set up an appointment somewhere, I just sat her down and started cutting. She was all for it, Chris and I had mentioned it to her a couple of times and she was actually excited to do it. I'll have to take a picture again when it's all dolled up. This is just after I cut it. I tried to do an A line cut. Chris was a little shocked when he came home, I don't think he was expecting me to chop that much off. eeek, I hope I can make it look cute. Go to our playlist and click on Just Dance, by Lady GaGa. This is our families latest favorite! We love to blast this on Saturday mornings and dance around the room. What do you mean Cade failed his eye exam? Cade came home with a letter saying he failed his eye exam for both eyes. Over the following week we continuously would have Cade stand back and tell us "how many fingers am I holding up? ", "What letter is this?" and so on. I couldn't believe we never noticed before, but sure enough he couldn't tell how many fingers we had up. He is doing pretty well with them, he was a little nervous the first day back to school. He had his hoody pulled down so low you could hardly see his face. It was really cute the day we picked up his glasses, the whole drive home he was pointing things out, reading signs and saying "mom when I take my glasses off that ___ is kind of blurry, but when I put them on it's not blurry!" 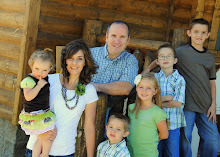 Recently, we had Elder Holland come visit our stake. It was a very personal and neat experience with an apostle of the Lord. As a kid, I remember going to the Sun Dome, I think it was called in Arizona to listen to one of the apostles, but they were so far away you couldn't even see them. I haven't had the chance to go to conference in Utah either so this was exciting! Chris is always more daring than I am though. 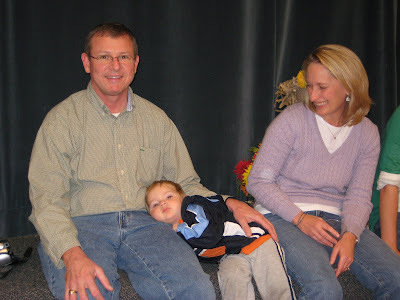 He thought to take the children and wait out in the foyer so that when Elder Holland walked out of the offices to enter the chapel he would have to walk right by them. Chris, had to give C.J. a nudge forward, but Chris & all the kids got to shake his hand. Chris was holding Mason in his arms and E. Holland squeezed Mason's cheeks and said that those were "Holland" cheeks. How neat is that! He was very personable and funny and short in stature. I'm not going to do this justice with what he said that is, but I'll try and give a few key remarks that touched Chris and I. He talked to the youth and mentioned how hard and trying these times are. He said it used to be that the rate of young men falling away from the Church was always higher, now that is not the case. The rate of young women is equal or if not more. He spoke shortly on tithing and asked the youth to compare that to their lives as well. If we are to live around a hundred years and were to devote 10% of our life to Jesus and basically hold to the rod with all your might, that it be the years of 12-22 or 14-24. I loved how he bore his testimony of Hinckley and the long life he spent serving the Lord and then he finished with his own. It was so powerful to hear his personal testimony and witness of the Gospel. What touched me was the amount of time they spend away from home and that he would never do this if it was all just a "ruse, a fairytale". He said he would only spend this much time away from wife, family and grandchildren for the Lord and because he KNOWS this is Jesus' true church. He exclaimed several times he doesn't just believe or strongly think that our Savior lives, but HE KNOWS. " There is not anything else that I could experience or hear or see that would make me believe more than what I already know". I couldn't help to think as I was sitting there Oh Yeah, this man has actually seen our Savior. 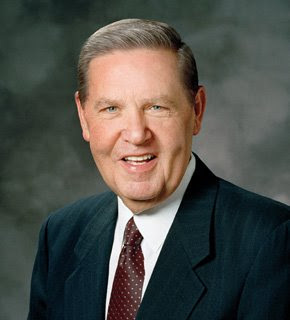 The other treasured event in this visit was the Apostolic blessing that Elder Holland pronounced unto everyone within in the sound of his voice. He blessed us that any righteous desire of our hearts that we stand in need of, can be ours! The spirit was so strong when those words were stated. After the meeting, E. Holland just stayed and shook hands, and visited with our members. Chris, stayed to help put away chairs and said he did not leave for over an hour after the meeting. 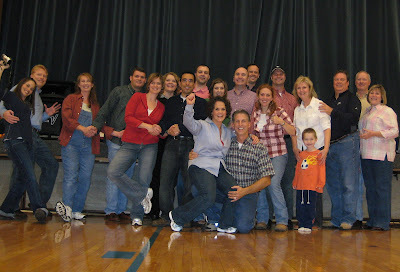 What a neat treasured experience we had and will always remember as a family. I found out later, there was over 1200 people in attendence at the building. I didn't get a chance to take a picture before it got dark, darn it all. CJ had a friend, (Sam)walk with us in our Neighborhood. 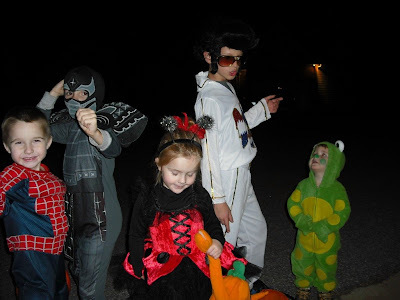 Sam was Elvis, I thought that was hilarious, he did a good job with the lip and hip sway. 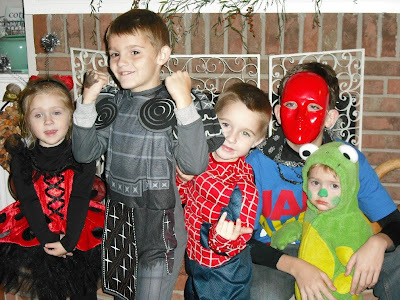 We have here a Lady Bug, Ninja, SpiderMan, Jabbawokeez Dancer and a frog. I think the frog wins. He's so dang cute. 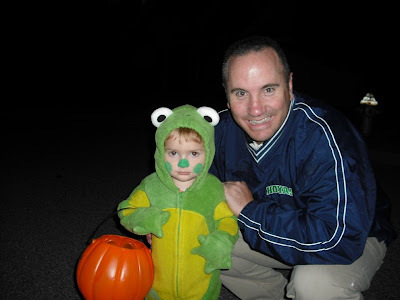 There's that cute frog again. We had a really big scare later that night. We had gone over to show our costumes to Auntie,the Weeks had had some of their friends over as well. 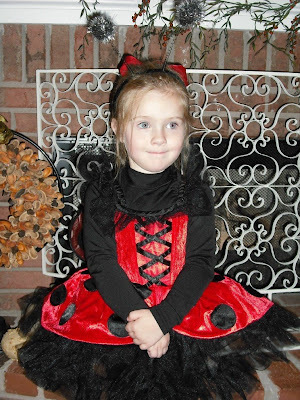 There were children runny around everywhere and in & out the door to give candy away. After awhile one of the kids asked where Cade was. We checked and called all through the house and couldn't find him. Earlier the kids had left several times to go trick or treating so we began to think that he must of ran off trying to catch up with the group and maybe got lost in the neighborhood. The adults got into a couple vehichles and searched the neighborhood while the kids ran from door to door calling his name. We did this for about 20-25mins. and still no sign of Cade. The streets were pretty much emtpy buy this point and we were freaking out. This is what I think is amazing, about the same time all the different groups began to arrive at the house and all of us had our separate thoughts that we should check our vehicle again. Sure enough CJ got there first opened the door and felt around until he found Cade curled up in a ball asleep in the back. The dome light hadn't come on because earlier that day Mason had pushed the override button so when whoever checked the first time couldn't see into the back. When things finally calmed down we figured out the story. Auntie, Chris and I had taken the kids over to a neighbor to show them the kids costumes on the way back Cade was so cold he ran ahead and jumped into the car to warm up, and accidently fell asleep, very quickly. Chris actually walked by the car and noticed the door was slightly open but thought it was just left open from when we first arrived and of course Chris didn't see him in there because the dome light wasn't on. I can't believe Cade didn't make a noise when Chris shut the door and it's hard to believe that he could have fallen asleep that fast, but then again Cade is known for falling asleep fast in really weird places. Our prayers were answered that night, thank you Father in Heaven. In second and third grade our school has the children participate in what's called Market Day. Each child has to come up with a project or service and decide how much to sell it for and how many to make. The kids get to walk around to all the different booths and buy from each other with their preearned tickets. 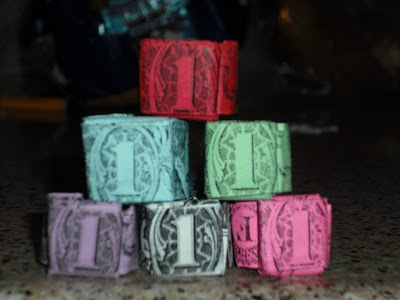 We came up with the idea to sell Dollar rings, good thing they gave us a month notice, we cut and folded about 50 rings. We are proud to say that CJ was able to sell all of his product!!! Yeah, CJ. 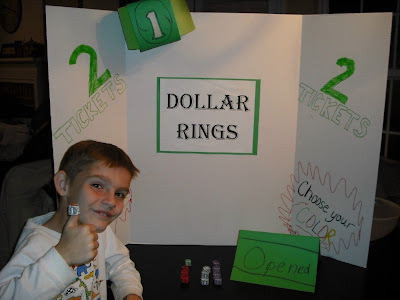 I thought it would be fun to do a raffle for a real Dollar ring, but CJ thought that was just too embarrassing. Funny kid. Do you remember the name Shawn Bradley? 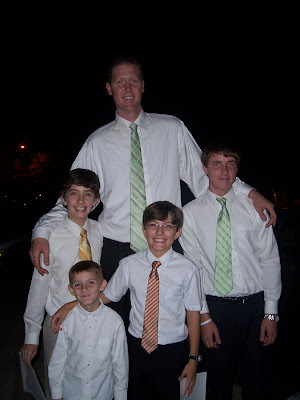 Chris had heard that Shawn Bradley the NBA basketball player would be in the Marietta area speaking at a fireside, so he took CJ, Connor and Tanner. Chris said it was very good and interesting, and said he mentioned some of the struggles of trying to keep gospel standards while in the NBA. Chris said he was really a nice guy and stuck around for awhile shaking hands and taking pictures. My good friend Ali decided to try and do a trade show with her little business. She had been talking about doing it for awhile and I thought it would be lots of fun to help. We had a good time trying to make all the crafts and getting everything ready. I have to say I think her booth was the cutest there. Vinyl is still kind of new out here so there wasn't anything like it at the trade show. 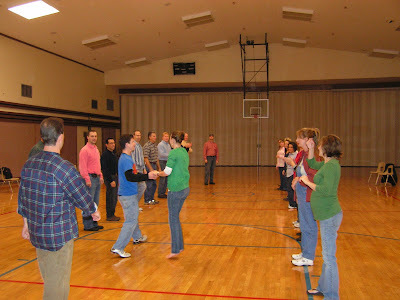 There is a gentleman in our ward that learned how to call square dances from his father, he has the perfect voice for it and is a very funny, witty guy. 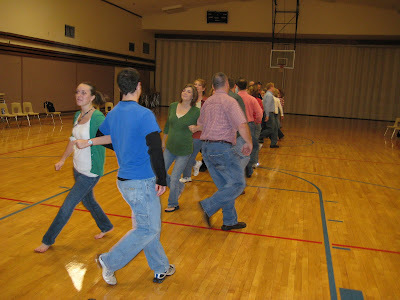 Our ward decided to put his talent to good use and set up a square dancing night! We brought along our kids and let them play in the nursery. Mason came to watch for awhile and we were surprised to see him cuddle up to a "stranger", to him anyways. I think Mason is our most shy child yet, which is funny since he is dragged around everywhere and meets new people all the time. Here's a group picture of the night!